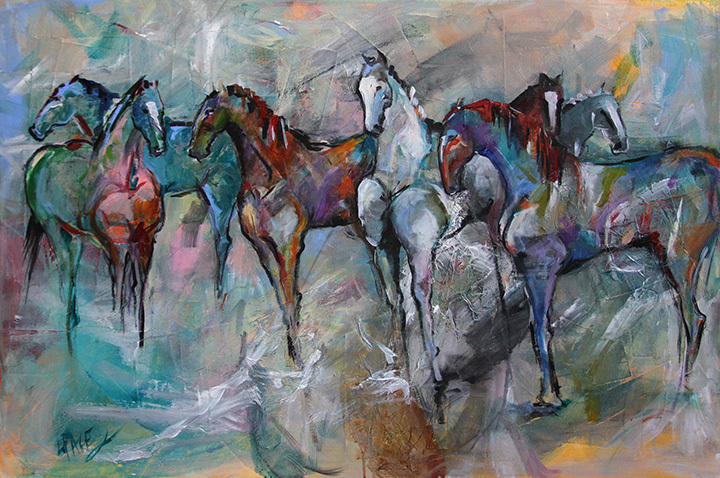 This painting was about a herd of horses...traveling together. Made me stop and think about travel in general. Many like to travel alone some do not. Alone it allows a certain freedom not found in everyday life when things are pulling you so many different directions. Some of us have a passion to travel. It offers a new world without limitations. The way my hubby handled it was to go to work for American Airlines. Before we married he loved jumping planes, often in the 'jump' seat as a mechanic and going to new places, meeting new people and embracing life and people in different countries. Hubby LOVES traveling alone. My younger brother does it now for work. He teaches worldwide and his calendar is filled with flights, plans, hotels, car rentals... a bit of jet lag here and there, but travel is in his blood. He can do it alone or with his sweet wife. I am the odd ball. I love to travel but prefer not to go by air. I prefer to travel with friends or family to share the experience and make memories together. What is your preference? Exodus 13:21 "By day the LORD went ahead of them in a pillar of cloud to guide them on their way and by night in a pillar of fire to give them light, so that they could travel by day or night." Not sleeping well? Did you dine well? A Family Favorite. The Clean World . . .